BookingcarCroatia.com car rental company is leading rent-a-car company in Croatia and we will provide to our customers best of features at most affordable prices. In our car rental rate are included features like customer care service, roadside assistance, third party insurance, collision damage waiver, unlimited mileage, online booking and theft protection, to let you enjoy safe stay in Croatia, because We care about your holidays in Croatia. Hire a vehicle in Croatia with bookingcarCroatia.com rental company and you can discover the country beautiful coastline with many hidden attractions which are most easily accessible by car. Croatia has over a 1000 islands and many national parks that can be easily accessed by a rent a car. Whatever driving route you choose, car rental in Croatia is definitely the way to go. BookingcarCroatia.com is the best car hire company in Croatia. Our cars are new and the fleet is renewed every year. Check our fleet at Car rental price list and you'll see we have for your vacations the right rental car in Croatia. Car hire from Zagreb Airport is easy at BookingcarCroatia.com rental company Croatia. Safety payment method via MasterCard or Visa credit card is available at BookingcarCroatia.com car hire. If you're searching to find Opatija car hire, the best solution is to rent a car at BookingcarCroatia.com car hire Opatija. 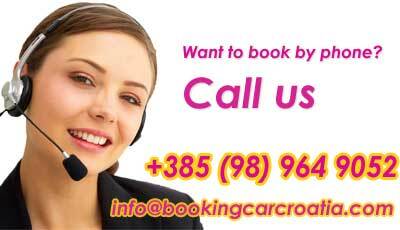 Car rental company BookingcarCroatia.com will secure trouble free Pula Airport car rental. BookingcarCroatia.com is one of the most reliable high standard service rent a car in Croatia with clear rental conditions with no hidden extras Car rental Terms and conditions . Our hire cars Croatia are maintained regularly by our high qualified mechanics turning your car rental from Zagreb to Dubrovnik Croatia into a safe journey. Before delivering the car at the airport, or anywhere we rent a car Croatia, or rent a car Croatia, all cars are inspected for tires, levels and general state. We operate every day and we will attend you in Opatija, Istrian cities Poreč, Umag, Pula, Rovinj, Rabac, region capitals Zagreb, Rijeka, Split, Dalmatian cities Zadar, Šibenik, Makarska, Cavtat and Dubrovnik. We will ensure to rent a car at airports, Zagreb Airport, Pula Airport, Rijeka Airport, Zadar Airport, Split Airport and Dubrovnik Airport.